Whew! 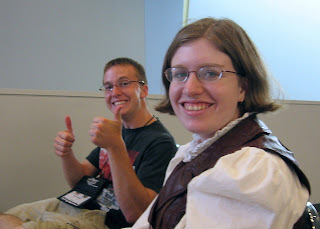 What a week it was at Origins 2010. Now that I'm home and have had time to get somewhat caught up on some sleep I think I might be able to share some of my experiences. I arrived in Columbus with my friend Brian (a college-age gamer who has been in my group since he was a preteen), Tuesday night. My wife and daughter had come down early to do some shopping for my daughter's college needs. We decided to stay in a hotel on the north side of Columbus for better rates and easier parking. 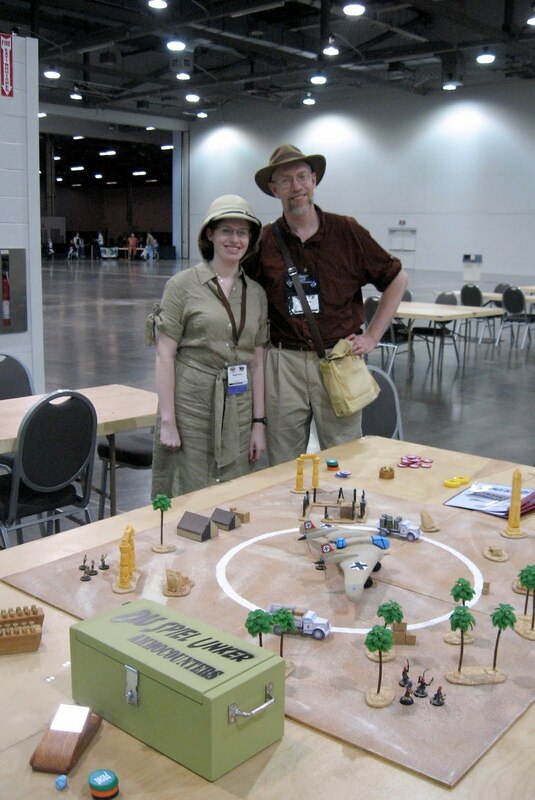 We arrived at Origins Wednesday mid morning. The registration line was it's usual craziness, but the volunteers were doing there best and all of our paperwork went smoothly. Each of us was in a different line; myself in the GM's, my daughter in the educator's and Brian in the regular preregistration. What seemed to be slowing the lines down was that the badges hadn't been printed out until just before the convention so those of us who arrived on the first day had to wait a little longer while our badges could be found. I did need to go back later to pick up my event tickets since they weren't with my badge and again for my GM vouchers since they weren't ready, but nothing difficult. Most of the attendees in the line were patient, but I did see a few badly behaved and angry ones. We need to remember that most of the people manning the registration line are volunteers and fellow gamers who are giving their time to try to make Origins the best it can be - so try to be kind. Attendance did seem to be up a little from the last few years. It's always good to see so many friends and acquaintances. Lots of hugs and waves. 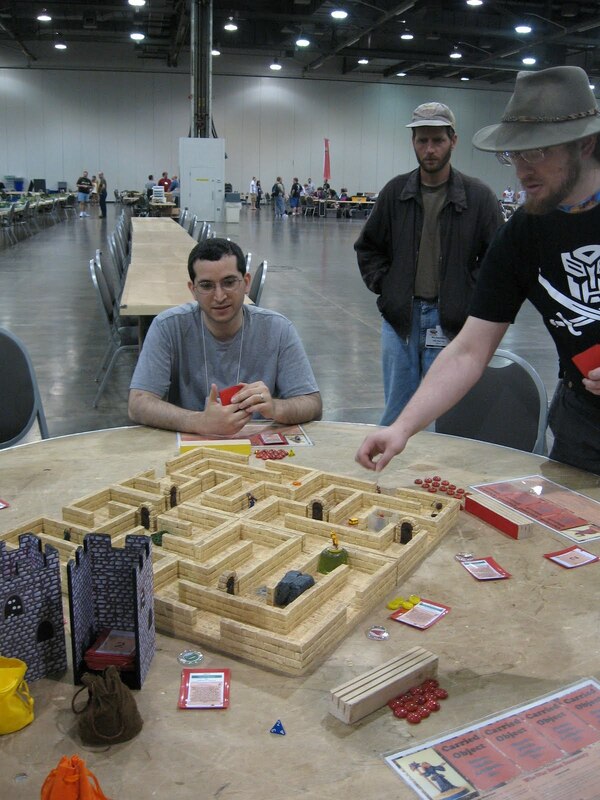 A really nice surprise was discovering that I had been allotted my own section of the miniature hall for my games. It really made setting up and running the games a lot easier than previous years. Thanks to Steve Smith, the miniatures director for that. 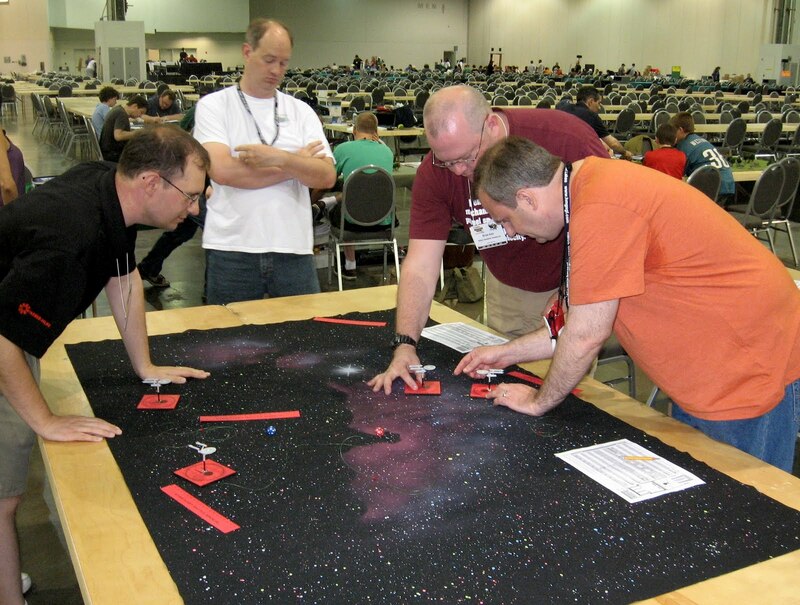 The first game I ran was a qualifier in the Star Fleet Battle Manual tournament. It was held mid afternoon on Wednesday and had four of the six seats prefilled. 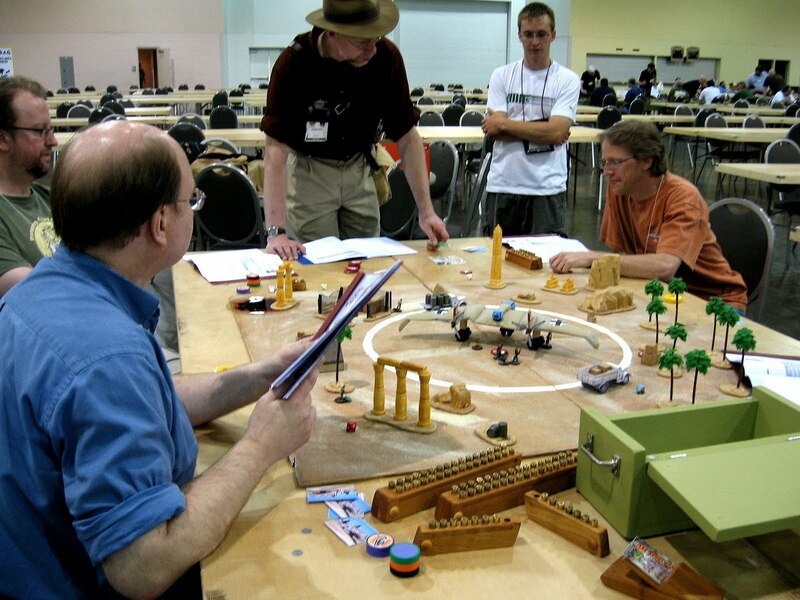 The game looked really good all set up and always drew a good crowd - lots of gamers who had played it in their younger days. Later I ran a sold out game of WizWar 3D, which is always a favorite. Then it was back to the room for some sleep. Thursday began bright and early with a 9AM (who scheduled that?) game of WizWar - again sold out. A good group of players and I know everyone loves to play it, but I'm getting tired of hauling that game around. Then it was time for some shopping in the dealers hall. I always try to hit the hall on Thursday to avoid the weekend crowds. The economy seems to effecting the size of some company's booths, but exhibiter space was sold out for the first time in many years - smaller booths, but more of them. A lot of first time attendees among the dealers which makes for a great shopping experience. Went to the Pinnacle/Studio 2 booth to grab a copy of the new Deadlands Reloaded Players Handbook and to visit with the Pinnacle staff. 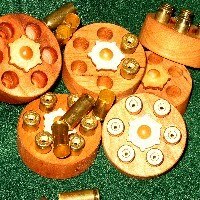 And to show off my AmmoCounters; they were met with oh's and ah's and approval. In fact they didn't want to let them go, but since I needed them for some of the games I would run later I took them with me. (I did give Mike some of them before I left on Sunday.) 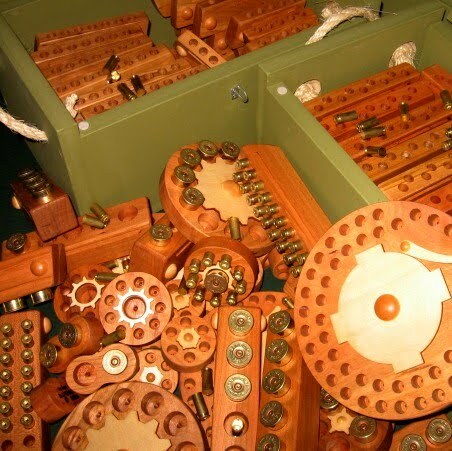 Then it was over to the Kenzerco booth to see if Jolly Blackburn received the AmmoCounters I had sent him. Was I surprised to see that they were Editor Picks for the newest copy of Knights of the Dinner Table (#164). I also had to pick up a copy of the Bag Wars Saga from them. My daughter was also pleased to have Jolly recognizer from her picture that was in the article I wrote for KODT #160. I made a quick stop at GameScience to see my friend Matt Ragsdale's dice tower display - truly a work of gamer art; plus it plays even more songs this year. I also needed to pick up some Gaming Paper, some grenade markers from Litko, and a copy of Rowboat from Moosetache Games (a nice new company with a fun game) Those were the items on my shopping list, the rest of the time was spent exploring all the booths and helping my daughter find items for her steampunk costume. 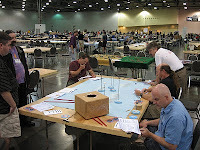 After a nice lunch at the North Market it was back for the second Star Fleet Battle Manual qualifier. My daughter and Brian spent a lot of time gaming - Hallow Earth, Savage Worlds, Aces & Eights, Realms of Ctuthulu to name a few. My wife joined us for a lovely dinner at Max & Ermas across the street from the convention center. A great place to eat and see friends. 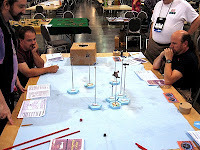 Friday morning was the last of the Star Fleet Battle Manual qualifiers, and then a game of my Crimson Eagles. The turn out for Crimson Eagles was up to six this year, so it is slowly growing. A good game with some really good players (in fact all the players in my games; mine and the one's I played in were good); it's a fast game so we just gave them a new plane every time some one got shot down. After a quick supper, we all played in a pulp RPG. It was a Hero System game (which none of us had played before, and have decided that none of us like), set in 1935 with rockets, Nazis, aliens, - you get the picture. A good group a players and a fun game even with a rule system we didn't enjoy. Saturday was the busy one. 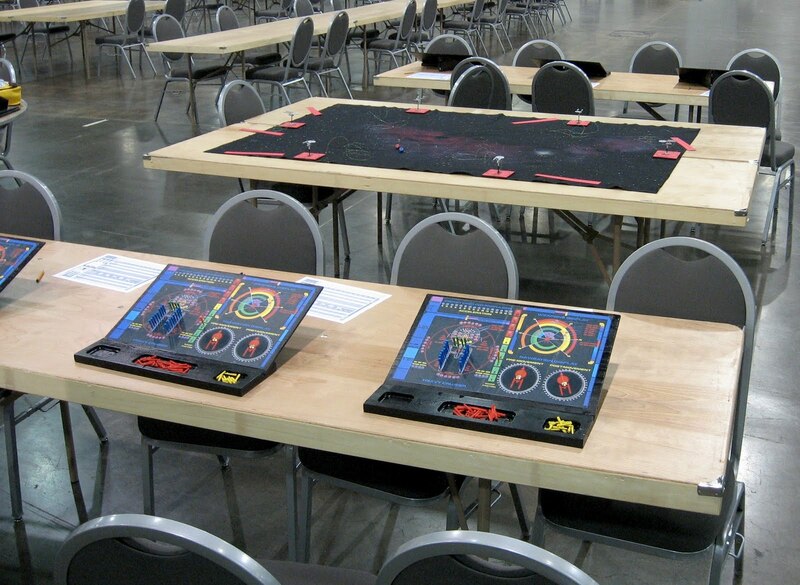 The Star Fleet Battle Manual tournament final was at 10AM so once again we got there early to set up. It was over at 10:05AM. 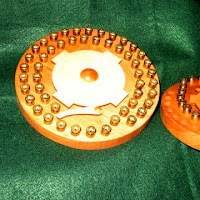 The players decided to use Klingon cruisers, and on the second round (the first they were allowed to fire), the winner fired a barrage that went through the shields and then rolled the only number that would destroy the other ship's life support. Lucky shot sir! At least it gave me time to do some more shopping - a copy of Pandemic, Say Anything, and Out of the Boxes 7 Ate 9 for a young friend who is having trouble with her math. Our seminar Learning With Games was scheduled for after lunch so we tracked down the PowerPoint projector (Yeah! they had one for us this year), and set up in the teacher's track room. A really good turn out this year, 35, which was over the limit of tickets, but OK. I think this will be the last year I present this lecture; it is really designed for the teacher who are new to gaming, but most of the attendees are old hands at it so I don't think I'm reaching the audience I need to. Also it was difficult because another lecture was scheduled for the room right after ours and it would have been nice for some time of questions and answers. Next it was time to run the .45 Adventure, Fight of the Flying Wing. It really looked good set up and lots of people stopped by to see it. 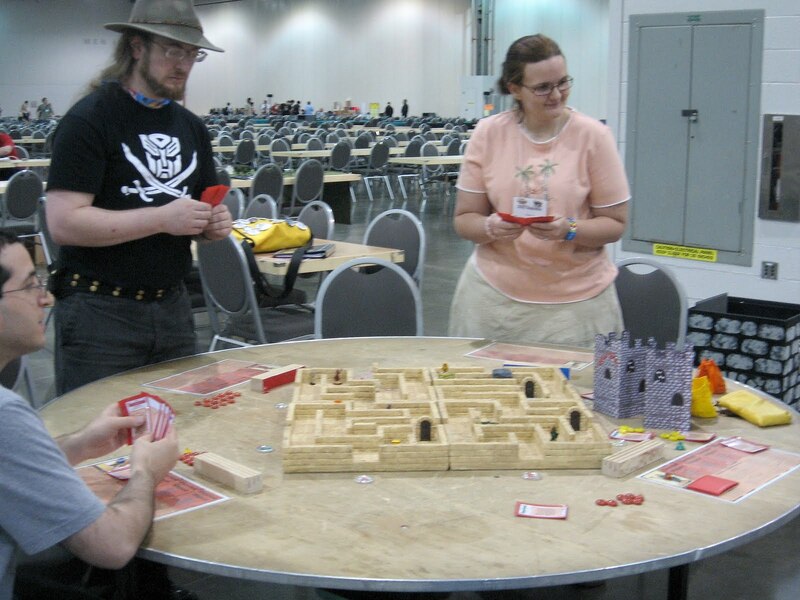 The event was sold out (with in a few hours of it going on sale last month), and it was the only .45 event scheduled for the con - I think Rattrap Productions might want to consider having a presence at Origins since this is the second year in a row that my games have sold out. The game went in a totally different direction then any of the play testing sessions went, but the players had a good time, which is all that matters. I used the AmmoCounter which added an extra element, both visual and play-wise, to the game. After a quick dinner, we headed over to Pinnacles Savage Saturday. This was the first time we had ever gone and we all had a great time. My daughter played in a Deadland's Showdown game and then a fantasy adventure. Brian was in a modern horror and then a fantasy one. I decided to GM a pulp adventure. In the more than 30 years that I have been GMing this is the first time that I have run a game at a convention so I was a little nervous. It went great. A really good group of players. My scenario involved sky pirates, Nazi's, and zombies on a zeppelin so how could I go wrong? 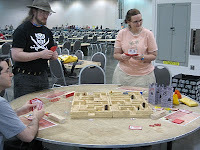 The AmmoCounters were a big hit - especially with all that brass hiting the table in the zombie battles. Sunday was pack up time; worship at our Columbus church with other gamers, GAMA staff, and fellow gamers; then back over to Origins to say good bye to friends and drop off some AmmoCounters at the Pinnacle Booth. So there it is. Another great year. Now to start planning my events for Origins 2011. So what have I been doing lately? Everything but posting on this blog. A lot of time has been spent getting my games ready for Origins. I could have played them months ago, but it's the little things that make the games so much better, but also take all the time. For instance - the minis for the Star Fleet Battle Manual tournament needed new decals; some of the planes for Crimson Eagles need repairs; a decides to use a few different minis for the .45 Adventure so those needed painted; and I haven't even started updating the seminar on Learning With Games. The biggest use of my time has been spent getting my company, Das Spiel Unker, up and running. 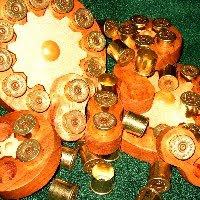 That has entailed a new website, advertising, and of course designing, making, and stockpiling the products: AmmoCounters. I have been making these for years for my gaming group (helps to be a woodworker with a full shop), and have often thought about offering these for sale. So now I am. These are used for keeping track of ammuntion in RPG's and miniature games that use fire arms. They are much more fun than simply marking off boxes on your character sheets. My group uses them for Savage Worlds (pulp and Rippers), .45 Adventures, and d20 Modern. They work well for Westerns, pulp, steampunk, and war games. 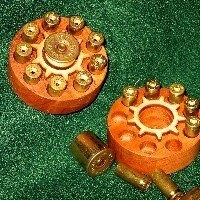 I make AmmoCounters for clips, shotguns, revolvers, the LaMatt, and my favorite - the Tommy Gun. 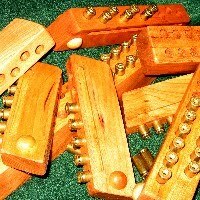 They are all made of hardwood so they will last for years. 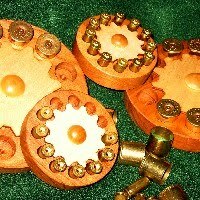 I think you will like them, so please check them out. At www.dasspielunker.com. The site also has my Crimson Eagles rules and my energy/damage allocation boards for Star Fleet Battle Manual on the Game Files page.